We have gained international acclaim and testimonials from our clientèle for the high quality that we deliver consistently. We are the prominent manufacturer and supplier of a wide rangeChain Pulley Blockthat is high in demand. We have gained international acclaim and testimonials from our clientèle for the high quality that we deliver consistently. We are the prominent manufacturer and supplier of a wide range Chain Pulley Block that is high in demand. Frame is rigidly built steel plates welded construction with high factor of safety. Worm Wheel is made of high-grade cast iron and worm shaft is made from high quality steel and heat treated. Forged hooks as per IS-8610, made from forged steel and move/rotate freely. 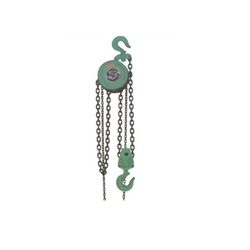 Hand Chain and Load Chain are used according to IS 2429/part II/70. Brake is easy & reliable in operation.